Under normal conditions, pure carbon exhibits vastly different physical properties depending on its structure. For example, graphite is soft, but diamond is one of the hardest materials known. Graphite conducts electricity, but diamond is an insulator. Graphite is the thermodynamically stable phase of carbon at ambient contitions, and the formation of diamond from graphite requires both high temperature and high pressure. The transformation from diamond back to graphite, however, is exceedingly slow. Experimental and theoretical work has revealed other phases of carbon, indicating extensive polymorphism of both stable and metastable allotropic forms, and the potential for a variety of intriguing physical properties. At pressures of ~20 GPa, Mao et al. observed a form of carbon formed from room-temperature compression of graphite [Science 302, 425-427 (2003)]. Recent computational studies suggest that this material adopts a body-centered tetragonal structure characterized by four-membered rings (Umemoto et al.[Phys. Rev. Lett. 104, 125504 (2010)], Zhou et al. [Phys. Rev. B 82, 134126 (2010)]). Now, a team including CDAC Partner Kanani Lee (Yale University) and co-workers from Yale and New Mexico State University has carried out cold-compression experiments on graphite at higher pressures and provided important new information about the structure of cold-compressed graphite in this pressure regime. Known as M-carbon, this form of the element is comparable in hardness to diamond but only requires pressure to synthesize. 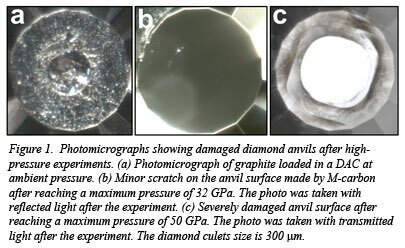 The superhard nature of M-carbon is confirmed by its ability to damage diamond (Fig. 1). Using x-ray diffraction, Raman spectroscopy, and optical techniques, the group sought to verify predictions of the structure initially made in 2006. Although more than a dozen different crystal structures have been suggested for a stable phase of carbon formed by cold compression of graphite, the proposed low-symmetry, monclinic, M-carbon structure proposed by Li et al. [Phys. Rev. Lett. 102, 1775506 (2009)]. is the only one that fits the high pressure data. The team believes that their findings could open the way for the synthesis of a superhard material that can withstand great force and can be used in electronic and industrial applications, as diamond-based materials are currently [Y. Wang et al., Sci. Reports 2, 520 (2012)].